Form MVU-21 is a Massachusetts Department of Revenue form also known as the "Affidavit In Support Of A Claim For Exemption From Sales Or Use Tax For A Motor Vehicle Transferred By Contest, Drawing Or Raffle". The latest edition of the form was released in April 1, 1999 and is available for digital filing. 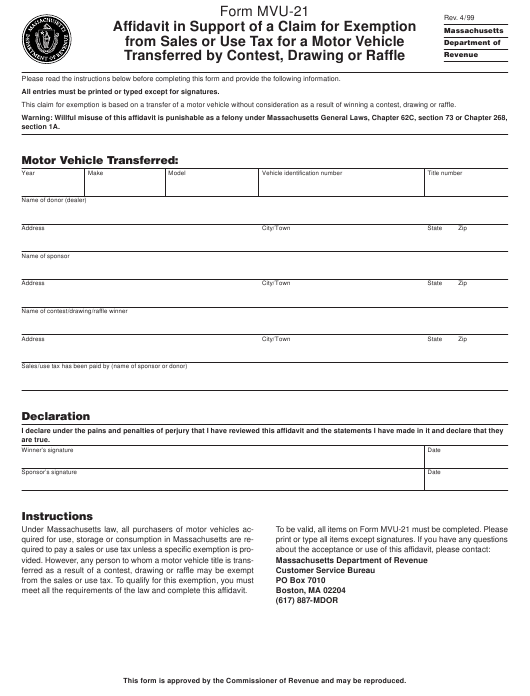 Download an up-to-date Form MVU-21 in PDF-format down below or look it up on the Massachusetts Department of Revenue Forms website. This claim for exemption is based on a transfer of a motor vehicle without consideration as a result of winning a contest, drawing or raffle. meet all the requirements of the law and complete this affidavit.